Hello everyone, today I wanted to take a closer look at the Certina watch brand and follow it up by featuring 5 of their most popular models and styles. Certina began as a Swiss watchmaker in 1888 when it was founded by Adolf and Alfred Kurth in Grenchen Switzerland. They originally started with just three employees working in a small workshop that connected to the family home. By 1938 they had grown and expanded to 250 employees to celebrate their 50th anniversary. By 1972 the company had over 900 people employed and produced approximately 600,000 watches every year. This led on to them becoming apart of the SMH Group which is commonly know as Swatch. You can learn more about Certina’s watch history on their wiki. 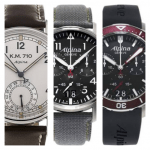 Are Certina watches any good? So you’ve had a quick fire history lesson on the Certina watch brand but are Cetina watches any good? That’s what many of you really want to know. 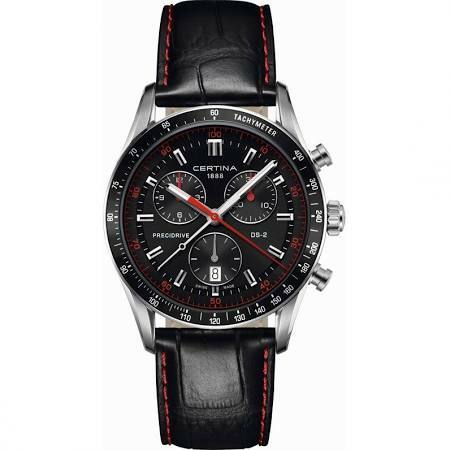 Certina are best known for their serious sports watches that feature their DS technology. What is this DS technology though? The DS concept came about in 1959 where Certina international reputation as a sports brand really grew. The DS (Double Security) system ensures extraordinarily robust design with a series of elaborate security features. These include scratch resistant sapphire crystal glass, a complicated system of seals to protect the stem and crown, as well as a reinforced case back. So to answer the question ‘are Certina watches good?‘ I’d say you’re damn right they are. They’re well-built watches with high quality parts and Swiss craftsmanship. And with all things considered I’d say they offer good value for money. 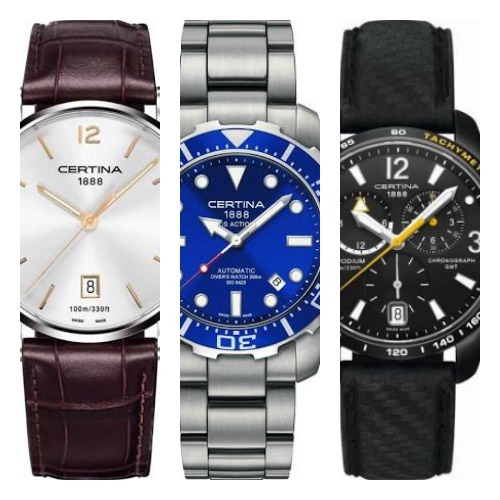 Below I’ve featured 5 of the best Certina watches for men. If you have any questions about any of these watches just comment below and let me know. 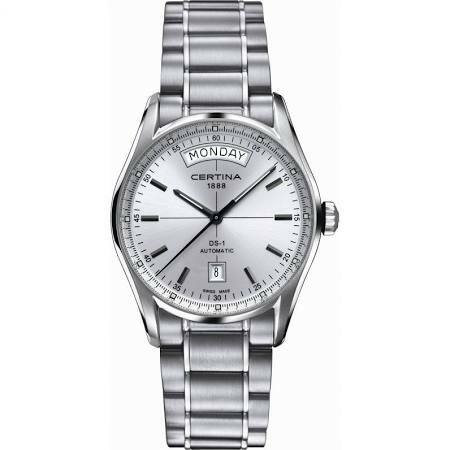 Here we have another popular men’s Certina watch which is in more of a dress style finish. It features a 38mm stainless steel casing with a thickness of 9mm making it quite a slim watch. It’s been paired up with this brilliant genuine leather strap and fastens with a buckle style clasp. This affordable Certina watch has a simple yet stylish dial design. The golden coloured hands and hour markers stand out nicely against the silver coloured background yet still have a minimal feel to them. There’s a small date display at the 6 o’clock position which could come in useful. 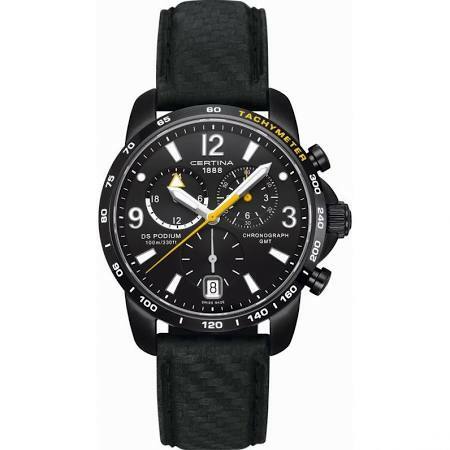 At the heart of this men’s Certina watch is a reliable and accurate Swiss made quartz movement. A sapphire crystal glass gives you an excellent level of scratch resistance so that’s always good to see. This timepiece also has a 100m water resistance rating. You can read my full C0174101603701 Certina watches review here soon. 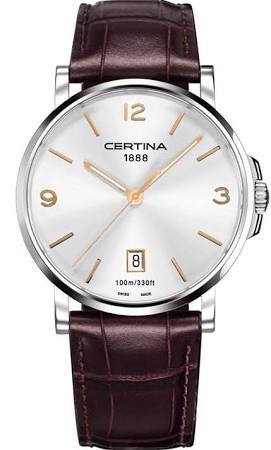 Up next is a popular Certina day date watch. This DS-1 automatic has a stainless steel casing with a diameter of 40mm and a thickness of 13mm. The strap of this model is also made of stainless steel and fastens with a fold-over deployment style clasp. The dial features this popular day date design with the day of the week shown at the top of the dial and the date of the month shown at the 6 o’clock position. They’ve gone for dark silver coloured baton hour markers which stand out against the lighter silver background. The hands and hour markers have a coating of lume for better visibility at night. This men’s Certina watch is powered by a Swiss made automatic movement which is great to have. It never requires a battery as it’s powered by the movement of your arm throughout the day when you wear it. Protecting the front of the watch is a sapphire crystal glass that gives you excellent scratch resistance. It also has a 100m water resistance rating. You can read my full C0064301103100 Certina watches review here soon. In at number 4 we have a Certina pilots watch that’s proven to be very popular. It’s built with a black ion plated stainless steel casing that has a diameter of 43mm with a thickness of 12mm. The strap is made of a soft genuine leather and fastens with a triple fold special buckle clasp. The dial shows off the capabilities of this chronograph GMT watch. As you’d expect with any pilot style watch, this model has a high visibility display with contrasting white hour markers that stand out against the black background. It also features a date display at the 6 o’clock position which may be useful to some. Powering this Certina watch is a high-end Swiss quartz movement for reliable and accurate timekeeping. A sapphire crystal glass protects the dial from scratches and knocks. This DS Podium also has a 100m water resistance rating. You can read my full C0016391605701 Certina watches review here soon. Last but not least on today’s list is this incredible Precidrive Certina watch. I’ll explain more about the Precidrive technology when I talk about the movement in a couple of paragraphs time. 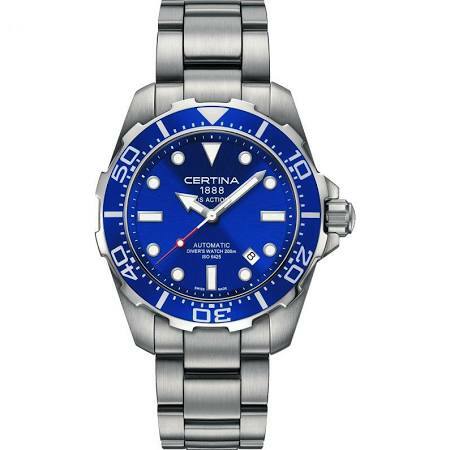 This men’s Certina DS sports watch is built with a 41mm stainless steel casing that has a thickness of 14mm. The strap is made of a genuine leather with red stitching for the racing finish. It fastens with a triple fold special buckle. The dial features a chronograph display with slim hands and baton style hour markers. I really like the use of the red detailing that matches up with the stitching and adds a nice amount of colour to the dial. Like the previous model, this Certina watch also has a date function at the 6 o’clock position. Inside this watch is a Precidrive quartz movement. This is an innovative technology that ensures the highest level of accuracy at Certina. Certina watches with Precidrive Quartz movements achieve real chronometer precision with a deviation rate of +/- 10 seconds per year. That makes it 10 times more accurate than a traditional quartz watch. A highly scratch resistant sapphire crystal glass protects the front of the watch. It also has a 100m water resistance rating which is very good to see. You can read my full C0244471605103 Certina watches review here soon. Thanks for taking the time to read through today’s Certina watches review. What was your favourite model from our featured list? Comment below and let us know. 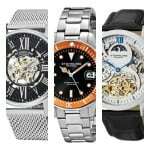 15 Best Rotary Watches Review – Are They Any Good? Glad to see Certina being covered; it is an obscure brand, despite being part of the massive Swatch Group, which is a real shame. It is decades older than Rolex and for nearly a hundred years was much better than it is allowed to be these days. Certina has been positioned by Swatch as an affordable brand. As Longines’ rich history and wonderful movements mean little today, so Certina’s historic calibres have been ditched, in the name of integration and “efficiency”, meaning practically every Swatch Group watch you can buy below Omega uses the same 2 movements. Exciting, eh? But that does not mean Certina are cheap, or badly-made, or not “real watches”. From my personal handling of many watches at this price-point including Hamilton, Mido Seiko, Citizen, I have formed the opinion that Certina’s fit and finish is a half-step up from the aforementioned brands. True, their offerings can be seen as traditional (generic, if you’re feeling unkind), but if they appeal to you, you will be buying a crisp, precise, considered case with a reliable movement. I heartily recommend the Precidrive line: this is one extremely welcome differentiator for the Certina line. These movements, particularly the Chronograph movement feature in the new model, are a real step up from your std mall quartz. The controller for the DS-2 Chronograph moment has 4GB of RAM and hits every 0.01s marker as it rotates around the dial! 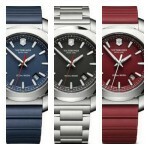 I’m going to be purchasing one of these Certina watches soon. Do you accept guest reviews? I would love to get into writing detailed watch reviews. Please let me know if you accept them? I enjoyed your Certina watches review. I’ve recently been looking at their automatic watches, a chronograph would suit me best as that’s my preferred dial type. Then again, I also like their day date watches like the watch at number 3, the Certina DS-1. Decisions decisions, going to be hard to pick a favourite.